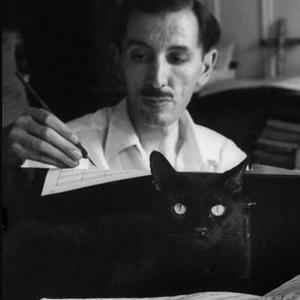 Alan Hovhaness (March 8, 1911 ? June 21, 2000) was an American composer of Armenian and Scottish descent. His music is accessible to the lay listener and often evokes a mood of mystery or contemplation. The Boston Globe music critic Richard Buell wrote: "Although he has been stereotyped as a self-consciously Armenian composer (rather as Ernest Bloch is seen as a Jewish composer), his output assimilates the music of many cultures. What may be most American about all of it is the way it turns its materials into a kind of exoticism. The atmosphere is hushed, reverential, mystical, nostalgic." His music is accessible to the lay listener and often evokes a mood of mystery or contemplation. The Boston Globe music critic Richard Buell wrote: "Although he has been stereotyped as a self-consciously Armenian composer (rather as Ernest Bloch is seen as a Jewish composer), his output assimilates the music of many cultures. What may be most American about all of it is the way it turns its materials into a kind of exoticism. The atmosphere is hushed, reverential, mystical, nostalgic." He was among the most prolific composers of the 20th century, composing 67 symphonies and more than 400 opus numbers. He was born as Alan Vaness Chakmakjian in Somerville, Massachusetts to Haroutioun Hovanes Chakmakjian (an Armenian chemistry professor at Tufts College who had been born in Adana, Turkey) and Madeleine Scott (an American woman of Scottish and English descent who had graduated from Wellesley College). At the age of five, the family moved from Somerville to Arlington, Massachusetts. Upon his mother's death (October 3, 1930), he began to use the surname "Hovaness" in honor of his paternal grandfather, and changed it to "Hovhaness" around 1944. The name change reflected increased pride in his Armenian heritage, something that had earlier been discouraged by his mother. Alan was interested in music from a very early age, writing his first composition at the age of four after being inspired by hearing a song of Franz Schubert. This first attempt at composition, a cantata in the early Italian style, was poorly received by his family, so he decided at this time to pursue astronomy, another of his early loves. He did, however, study piano, first with Adelaide Proctor and then with Heinrich Gebhard. By age 14, Hovhaness decided to devote himself to composition. Among his first and most important influences were the recordings of Gomidas Vartabed, a great Armenian composer who had lived through the Armenian Genocide. He composed two operas during his teenage years, which were performed at Arlington High School, and the composer Roger Sessions took an interest in his music during this time. Following his graduation from high school in 1929, he studied with Leo Rich Lewis at Tufts and then the New England Conservatory of Music, under Frederick Converse. In 1932 he won the Conservatory's Samuel Endicott prize for composition, for a symphonic work entitled Sunset Symphony (elsewhere entitled Sunset Saga). In July 1934, with his first wife, Martha Mott Davis, he traveled to Finland to meet the composer Jean Sibelius, whose music he had greatly admired since childhood. The two remained in correspondence for the next twenty years. In 1936 Hovhaness attended a performance in Boston by the Indian dance troupe of Uday Shankar (with orchestra led by Vishnudas Shirali), which began the composer's lifelong interest in the music of India. During the 1930s (until 1939) he was employed by the WPA's Federal Music Project. During the 1930s and 1940s, Hovhaness famously destroyed many of his early works. He later claimed that he had burned at least 1000 different pieces, a process that took at least two weeks; elsewhere he claimed that he had destroyed approximately 500 works, up to 1000 pages in total (Gagne 1993, 121). In an interview with Richard Howard, he stated that the decision was based primarily on Roger Sessions' criticism of his works of that period, and that he wished to have a new start in his composing. Hovhaness became interested in Armenian culture and music in 1940, as the organist for the St. James Armenian Apostolic Church in Watertown, Massachusetts, remaining in this position for approximately ten years. In 1942 he won a scholarship at Tanglewood to study in Bohuslav Martin? 's master class. However, Martin? had a serious fall in the early summer which made it impossible for him to teach. Instead, the composer's seminar which Hovhaness attended was led by Aaron Copland and Leonard Bernstein. While a recording of Hovhaness's first symphony was being played, Copland talked loudly in Spanish to the Latin American composers in the room, and when the recording finished, Bernstein went to the piano, played a melodic minor scale, and remarked, "I can't stand this cheap ghetto music." Hovhaness was angered and distraught by his experience at Tanglewood, and quit early despite being on scholarship. Following this experience, he again destroyed a number of his works. The next year he devoted himself to Armenian subject matter, in particular using modes distinctive to Armenian music, and continued for several years, achieving some renown and the support of other musicians, including John Cage and Martha Graham, all while continuing as church organist. Beginning in the mid-1940s, Hovhaness and two artist friends, Hyman Bloom and Hermon di Giovanno, met frequently to discuss spiritual and musical matters. All three had a strong interest in Indian classical music, and brought many well known Indian musicians to Boston to perform. During this period, Hovhaness learned to play the sitar, studying with amateur Indian musicians living in the Boston area. Around 1942, Bloom introduced Hovhaness to Yenovk Der Hagopian, a fine singer of Armenian and Kurdish troubadour songs, whose singing served as an inspiration to Hovhaness. "I propose to create an heroic, monumental style of composition simple enough to inspire all people, completely free from fads, artificial mannerisms and false sophistications, direct, forceful, sincere, always original but never unnatural. Music must be freed from decadence and stagnation. There has been too much emphasis on small things while the great truths have been overlooked. The superficial must be dispensed with. Music must become virile to express big things. It is not my purpose to supply a few pseudo intellectual musicians and critics with more food for brilliant argumentation, but rather to inspire all mankind with new heroism and spiritual nobility. This may appear to be sentimental and impossible to some, but it must be remembered that Palestrina, Handel, and Beethoven would not consider it either sentimental or impossible. In fact, the worthiest creative art has been motivated consciously or unconsciously by the desire for the regeneration of mankind." "There is almost nothing occurring most of the time but unison melodies and very lengthy drone basses, which is all very Armenian. It is also very modern indeed in its elegant simplicity and adamant modal integrity, being, in effect, as tight and strong in its way as a twelve-tone work of the Austrian type. There is no harmony either, and the brilliance and excitement of parts of the piano concerto were due entirely to vigor of idea. It really takes a sound musicality to invent a succession of stimulating ideas within the bounds of an unaltered mode and without shifting the home-tone." Lousadzak was Hovhaness's first work to make use of an innovative technique he called the "spirit murmur" ? an early example of aleatoric music that was inspired by a vision of Hermon di Giovanno. The technique involves instruments repeating phrases in uncoordinated fashion, producing a complex "cloud" or "carpet" of sounds. In the mid-1940s Hovhaness' stature in New York was helped considerably by members of the immigrant Armenian community who sponsored several high-profile concerts of his music. This organization, the Friends of Armenian Music Committee, was led by Hovhaness's friends Dr. Elizabeth A. Gregory, the Armenian American piano/violin duo Maro Ajemian and Anahid Ajemian, and later Anahid's husband, pioneering record producer and subsequent Columbia Records executive George Avakian. Their help led directly to many recordings of Hovhaness' music appearing in the 1950s on MGM and Mercury records, placing him firmly on the American musical landscape. In May and June of 1946, while staying with an Armenian family, Hovhaness composed Etchmiadzin, an opera on an Armenian theme, which was commissioned by a local Armenian church. In 1948 he joined the faculty of the Boston Conservatory, teaching there until 1951. His students there included the jazz musicians Sam Rivers and Gigi Gryce. In 1951, Hovhaness moved to New York City, where he took up composing full-time. Also that year (beginning August 1), he worked at the Voice of America, first as a script writer for the Armenian Section, then as Director of Music, composer, and musical consultant for the Near East and Trans-Caucasian section. He eventually lost this job (along with much of the other staff) when Dwight D. Eisenhower succeeded Harry S. Truman as U.S. president in 1953. Beginning at this time, Hovhaness branched out from Armenian music, adopting styles and material from a wide variety of sources. In 1953 and 1954 he received Guggenheim Fellowships in composition. In 1954 he wrote the score for the Broadway play The Flowering Peach by Clifford Odets, a ballet for Martha Graham (Ardent Song, 1954), and two scores for NBC documentaries on India and Southeast Asia (1955 and 1957). Also during the 1950s, he composed for productions at The Living Theatre. His biggest breakthrough to date came in 1955, when his Symphony No. 2, Mysterious Mountain, was premiered by Leopold Stokowski in his debut with the Houston Symphony. The idea that Mysterious Mountain was commissioned for the Houston Symphony is a common misconception . That same year, MGM Records released recordings of a number of his works. Between 1956 and 1958, at the urging of Howard Hanson (who was an admirer of his music), he taught summers at the Eastman School of Music. From 1959 through 1963, Hovhaness conducted a series of research trips to India, Hawaii, Japan, and South Korea, investigating the ancient traditional musics of these nations and eventually integrating elements of these into his own compositions. His study of Carnatic music in Madras, India (1959-60), during which he collected over 300 ragas, was sponsored by a Fulbright fellowship. While in Madras, he learned to play the vina and composed a work for Carnatic orchestra entitled Nagooran, inspired by a visit to the dargah at Nagore, which was performed by the South Indian Orchestra of All India Radio Madras and broadcast on All India Radio on February 3, 1960. He compiled a large amount of material on Carnatic ragas in preparation for a book on the subject, but never completed it. He studied Japanese gagaku music (learning the wind instruments hichiriki, sh?, and ry?teki) in the spring of 1962 with Masatoshi Shamoto in Hawaii, and a Rockefeller Foundation grant allowed him to conduct further gagaku studies with Masataro Togi in Japan (1962-63). Also while in Japan, he studied and played the nagauta (kabuki) shamisen and the j?ruri (bunraku) shamisen. In 1963 he composed his second ballet score for Martha Graham, entitled Circe. In 1965 he visited Armenia (then under Soviet control), the only time during his life that he would visit his ancestral homeland. While there, he donated his handwritten manuscripts of harmonized Armenian liturgical music to the Yeghishe Charents State Museum of Arts and Literature in Yerevan. "We are in a very dangerous period. We are in danger of destroying ourselves, and I have a great fear about this...The older generation is ruling ruthlessly. I feel that this is a terrible threat to our civilization. It's the greed of huge companies and huge organizations which control life in a kind of a brutal way...It's gotten worse and worse, somehow, because physical science has given us more and more terrible deadly weapons, and the human spirit has been destroyed in so many cases, so what's the use of having the most powerful country in the world if we have killed the soul. It's of no use" (Michaelyan 1971). Hovhaness was inducted into the National Institute of Arts and Letters (1951), and received honorary D.Mus. degrees from the University of Rochester (1958), Bates College (1959), and the Boston Conservatory (1987). He moved to Seattle in the early 1970s, where he lived for the rest of his life. In 1973 he composed his third and final ballet score for Martha Graham: Myth of a Voyage, and over the next twenty years (between 1973 and 1992) he produced no fewer than 37 new symphonies. Continuing his interest in composing for Asian instruments, in 1981, at the request of Lou Harrison, he composed two works for Indonesian gamelan orchestra, which were premiered by the gamelan of Lewis & Clark College, under the direction of Vincent McDermott. Hovhaness is survived by his wife, the coloratura soprano Hinako Fujihara Hovhaness, who administers the Hovhaness-Fujihara music publishing company; as well as a daughter, the harpsichordist Jean Nandi (born Jean Christina Hovaness on June 13, 1935, and named after Jean Christian Sibelius, her godfather). In 2004 plans were announced to establish an Alan Hovhaness International Research Centre in Yerevan, Armenia, to be part of that nation's State Museum of Arts and Literature. The centre, intended as a world center for Hovhaness research, will house a comprehensive archive of materials related to Hovhaness.